Great Britain Under-16 duo Tamara Fournillier-Onadeko and Asha Andrews led Sevenoaks, with Fournillier-Onadeko stuffing the stat sheet on her way to 18 points, 14 rebounds, seven assists and seven steals to pick up MVP honours, whilst Asha Andrews finished with 16 of her 22 points in the first half, adding six assists. “It was a great team effort and we’re all really excited,” Fournillier-Onadeko commented. “I thought the girls played terrific and everyone contributed,” Sevenoaks Head Coach Len Busch said. Nottingham were led by 25 points from Masie Evison, and a 13 point, 13 rebound double-double from Mariam Olawoyin. “They’re a strong side, they’ve got some very talented players,” Nottingham Head Coach Steven Lindsey said. 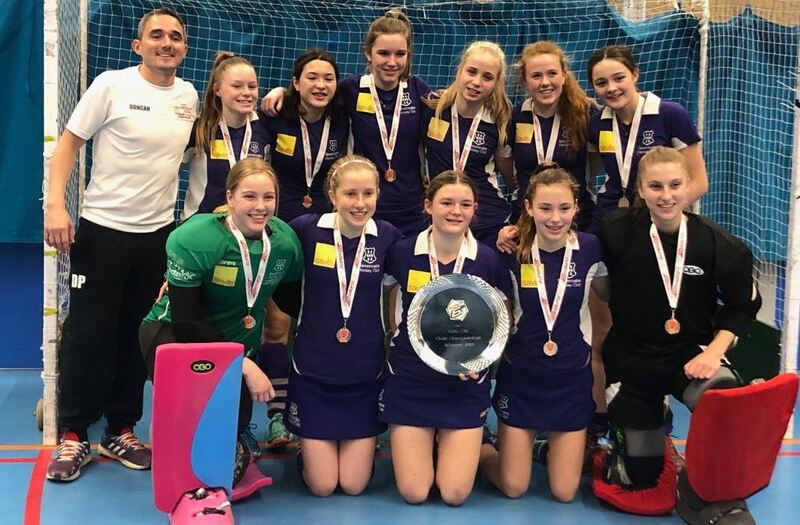 Sevenoaks Hockey Club celebrated their Under 16 girls success on Sunday afternoon as they won the Super 6s U16 Girls Clubs Finals 2019. The tournament, held in Wolverhampton, got off to a great start for the girls on Saturday as they cruised to victories over Marlow and Clifton to propel them to the top of their Pool. The high-level of their performances continued into Sunday as they defeated Stourport and Wakefield before over-coming a tough semi-final against Surbiton. Lottie Bingham got her side off to a cracking start in the Final against Repton after putting away a Penalty Corner in the 10th minute. The first half was played out for Sevenoaks to go in at the half 1-0 up. However, two minutes into the second half Annabel Cheveley took everyone by surprise, scoring a hat-trick of field goals in just four minutes to take the title away from their opponents. Repton got two late goals, but were unable to topple the title winning girls from Sevenoaks. Boys are good to go too! Sevenoaks Hockey Club’s U16 boys are the 6th best indoor team in the country, the only team that beat them over regionals and national finals was Winchester who won the National title. The club stated on Twitter that they “are very proud even though there was no silver ware to show for it”. The senior men’s side will this week be preparing for their final four appearance at the Copper Box Arena in London on Sunday as they playoff against Surbiton for a place in the Grand Final later that day. From all of us here at Sevenoaks Sports, well done to all the Under 16’s who have impressed us over the weekend and to the Sevenoaks Men’s 1st XI, good luck on your adventures on Sunday.